Like a lot of people, I listen to a lot of “grid” music. Grid music is any music with a clear, consistent, and steady meter. By this definition, most music is grid music. Electronic music–especially the kind with steady beats, which is sometimes referred to as electronic dance music–is uber grid music. All of its sounds are organized around (usually) a 4/4 metric grid, quantized to the grid, and flowing along the constraints of the grid. Even electronic musicians in whose work the rhythmic fabric is unusually loose and funky–like tracks by Flying Lotus, say–the music remains organized in relation to an implicit grid. Harold Budd though, is off the grid–way off the grid. And this is what makes his music so refreshing. While I have written about Budd and his music before on this blog, I don’t know much about his musical philosophy (if in fact there is one). 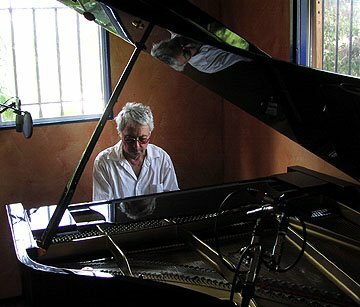 Wikipedia says that Budd creates his slow and sustained piano soundscapes using an approach he calls “soft pedal” but that doesn’t fully explain the sound. (The soft pedal is the leftmost of the three piano pedals. When depressed it softens the sound of the instrument.) Whatever Budd’s method, the result sounds free and spacious, soaring above the conventions of the nearest contemporary musical style landmarks such as ambient or new age or post-minimalist classical. And the music is off the grid not only rhythmically, but harmonically too. His chords–maybe they’re not quite chords, but rather the result of the sustain pedal blurring sequences of notes together?–don’t create a sense of goal-oriented motion. Instead, they just float and slowly hover like clouds. The music is vaguely episodic, as if composed of various snapshots of some kind of nature setting. However it might be described, Budd’s musical voice is a singular voice. It does its own thing, creating its own kind of space to inhabit, and this is good.